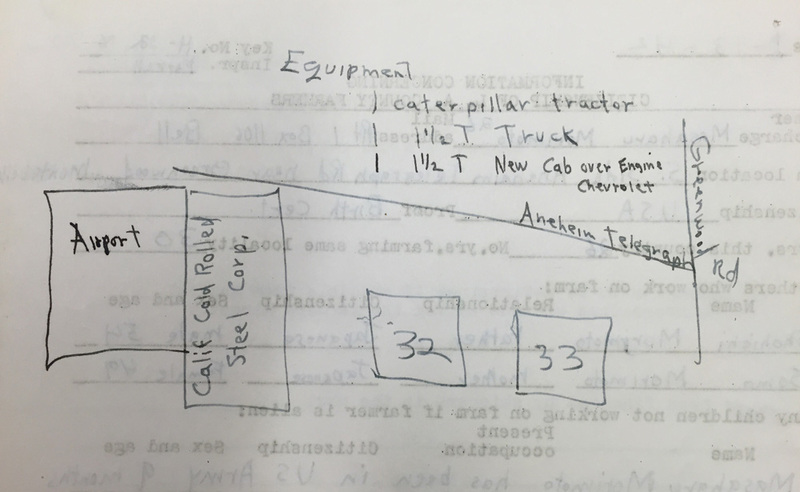 Notes taken during the 1942 Japanese Farm Survey. Japanese American National Museum. JANM welcomed new Archivist Jamie Henricks to the staff in May. In her first blog post below, Jamie updates us on one of the many projects she’s been working on—completing museum finding aids for the Online Archive of California. Alhough JANM is fortunate to have a vast collection of materials, only a fraction is on display at any one time. To make more of the collection accessible to the public, the museum’s Collections Management and Access (CMA) Unit is an active contributor to the Online Archive of California (OAC), which provides access to descriptions of archival collections held at more than 200 libraries, archives, museums, and historical societies throughout California. On JANM’s OAC page, there is a list of collection finding aids. Click on any link to read about a collection, including its contents, background information about the people and organizations involved, and other details. Some finding aids link directly to digital copies of materials (such as diaries or photo albums), and others offer the chance to learn more by coming to JANM for a research visit. 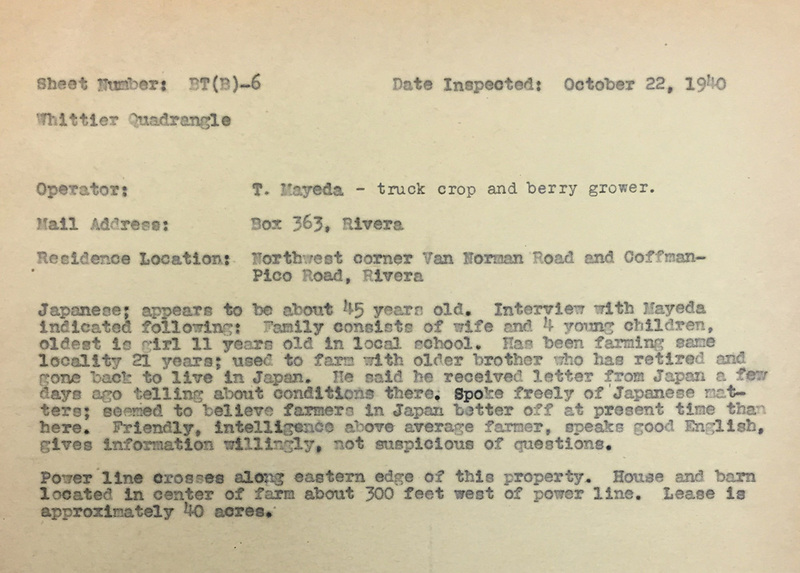 Inspection report from the 1940 Japanese Farm Survey. Japanese American National Museum. Two recently processed collections provide insights that bookend the Japanese American World War II incarceration experience. 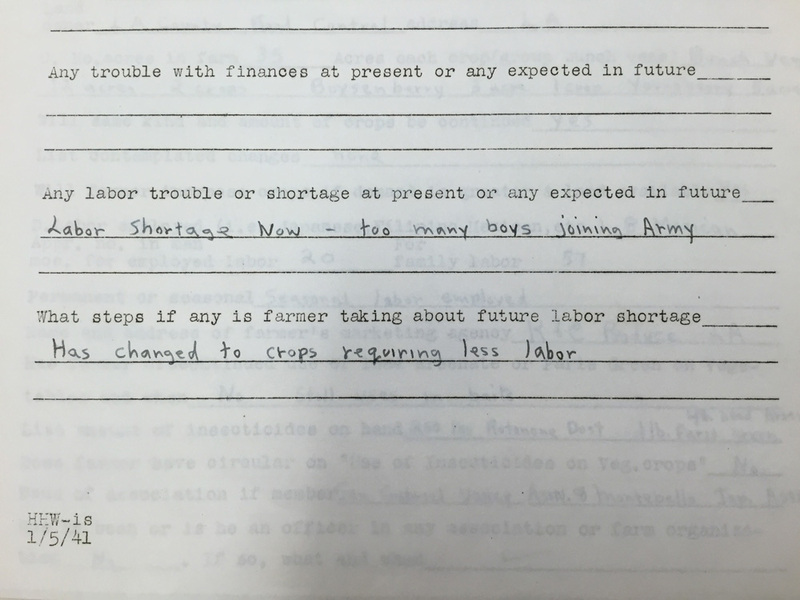 The Japanese Farm Survey for Defense Records demonstrate how Japanese Americans and other enemy aliens were viewed before and shortly after the bombing of Pearl Harbor, while the E.O. 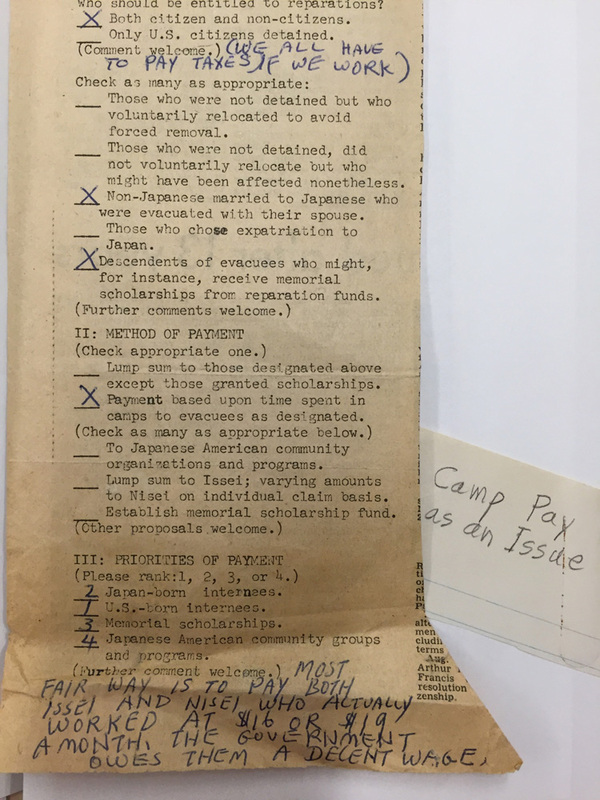 9066 Inc. Records show the wide range of opinions from Japanese Americans about their treatment and what types of reparations should be made. The first Japanese Farm Survey was conducted in 1940 by the Los Angeles County Agricultural Commission, at the request of the Home Protection Committee of the Los Angeles Chamber of Commerce. Most of the 147 properties inspected were Japanese-owned (although other “resident aliens” surveyed included Germans, Italians, Filipinos, and Chinese) and located along major power transmission lines and aqueducts. It appears officials were worried about sabotage or tampering of the nation’s infrastructure by non-citizens. The reports include observations about the individuals and their land holdings, their proximity to power lines, their level of English proficiency, and their personal backgrounds. Inspectors often commented with surprise on how intelligent the interviewees seemed. Part of a page from the 1942 Japanese Farm Survey. Japanese American National Museum. After the first report concluded that 80 to 90 percent of farms owned by Japanese individuals were run by non-citizens, a second survey was conducted in January 1942. This survey contains details about each farm owner, including names, ages, genders, citizenship, registration numbers, and ports of entry, and their business, including farm location, workers employed and their citizenship status, number and type of crops, whether they will seek loans to try to buy more land, use of pesticides, marketing and membership in organizations, and whether or not the farm expects any labor shortages or financial troubles. Some of the questions feel ominous in retrospect, considering how many thousands of people of Japanese ancestry would be forced to drop everything and abandon their farms, some within just two months of responding to this survey. A response to E.O. 9066, Inc.’s survey regarding incarceration and reparations. Japanese American National Museum. In 1975, E.O. 9066, Inc. was formed as an outcome of a reparations panel sponsored by the San Fernando Valley Chapter and the Pacific Southwest District of the Japanese American Citizens League (JACL). The nonprofit’s goals were to educate the public about the forced removal and imprisonment of Japanese Americans, propose legislation to compensate those affected by Executive Order 9066, and ultimately have the Supreme Court review the constitutionality of the order as well as the landmark Korematsu v. United States and Hirabayashi v. United States cases. After conversations within the Japanese American community, a survey of the LA area was circulated in The Rafu Shimpo newspaper and handed out by the JACL (though responses were tallied from around the United States). It asked for details regarding the respondents’ incarceration experiences and their opinions on what and how reparations should be paid. The results indicated general support for redress efforts, and many responses came in the form of handwritten or typed notes. The comments are extremely wide-ranging and fascinating to read, and even the labels assigned to various groupings (e.g. “cynical”) give a good indication as to common threads of thinking. Requests to access JANM’s permanent collection can be made by contacting the CMA Unit at collections@janm.org. Appointments must be scheduled in advance and documentation as to the purpose of the research visit is required. Fees may apply.